I have a friend who writes about ethics. Since I write about movies, we rarely get to write about the same subject. Ours are non-overlapping magisteria. Recently, however, one of Alonzo Fyfe’s most popular pages has been about a movie. Ben Stein is recognizable to film fans from my generation as the deadpan teacher who gets stuck on Ferris Bueller’s name during roll call. His latest film is Expelled: No Intelligence Allowed, about the terrible things done to proponents of intelligent design by scientists and academics. You may have seen ads for it on Movie Habit, served from Google’s Adsense. Or perhaps you saw the “Fast Chat” with Ben Stein in Newsweek. “Theocrats want to argue that we can control the severity – even the existence of hurricanes by passing laws against homosexuality, putting prayer in school, and closing down abortion clinics. They have got the fanatical belief that these variables somehow influence the nature of hurricanes. Let us assume that [an] engineer wants to teach at an engineering college where he will inform countless students that clay bridges are structurally sound. And when the engineering department denies him a position, he goes to court, claiming that they are violating his rights to free speech. Clearly, he has a right to stand before a bunch of students and tell them that common clay bridges are structurally sound. By your standards, such a teacher must be permitted to teach that common clay is as good as steel, because refusing to do so would be a morally impermissible violation of that individual’s right to freedom of speech. In fact, if we were to make your principle a universal law, as the moral philosopher Immanual Kant contends, any attempt to regulate the quality of teaching is a violation of free speech. No individual shall be denied a position in a university based on the quality of his research — but all individuals shall be permitted to teach whatever they want to whomever they want. Fyfe followed up his letter with a blog post questioning whether Expelled should be evaluated as a documentary, when it might be better to think of it as propaganda. Lest you think Fyfe is being overdramatic, I suggest you watch the trailer for yourself. 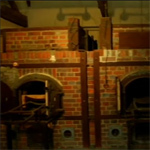 It shows footage of concentration camp ovens while Stein is saying “Darwinism might be dangerous.” It ends with the paranoid-yet-tantalizing suggestion that you might become a pariah or get fired from your job if you dare to see Expelled. Newsweek asked Stein whether the Darwinism/Nazism comparison was fair. Stein’s unsatisfying response is that “Darwinism was very popular with Hitler’s Nazi party [... which] led to horrible consequences.” Even I, a simple film major, know that evolution is a descriptive scientific theory, and not a prescriptive moral philosophy. Maybe Hitler made that mistake, but Ben Stein should know better than to repeat it. Nevertheless, if the controversy piques your interest, you may find yourself buying a ticket to the movie. If, afterwards, you feel dirty for having given the filmmakers your money, you might enjoy Fyfe’s most recent post on the subject. In Expelled and Truth Tickets, he encourages a “truth ticket” donation to the National Center for Science Education. If you want to atone for having paid to see Expelled, (or even if you just like science) Fyfe suggests you donate the price of a movie ticket to the NCSE (search for the “Donation Only” radio button). As did Fyfe, I just bought “tickets” for everyone in my immediate family, including my cats (whom Fyfe points out will benefit from advances in biological science). He suggests ten bucks, although I think you can still find tickets in Boulder/Denver for $9.50. Now if I could only convince Alonzo to see more than four movies a year, maybe we could do this more often.